Hello! I am so glad to be back here with my literacy friends! I have been gone for awhile trying desperately to get caught up on the back to school crazies as well as moving into a new house! YAY! Not to mention that TODAY is my oldest son's birthday. He is 12! How is that possible??? But the dust is settling and it is time to get busy! So I am coming today to talk to you about data.....du du dun! I know it is a word that we all tend to dread, but I am here to help! It is the time of year when we are all thinking about data. We have tested our kids and now we have to analyze all of our data to see what we should do next. 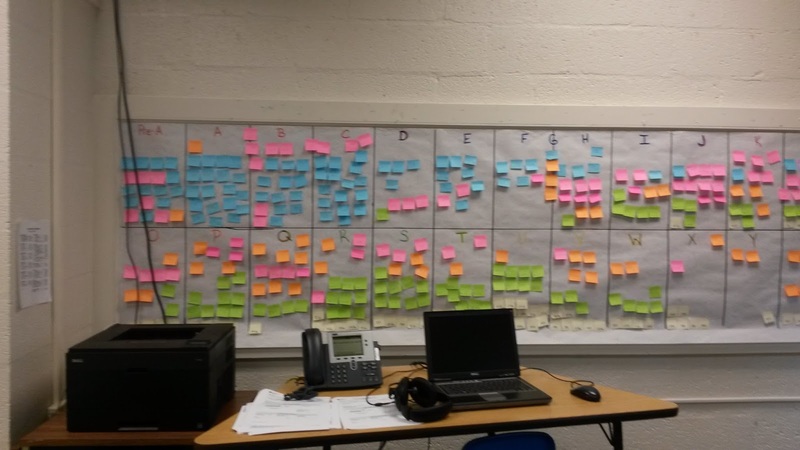 I am going to share with you my school wide data wall. I approached my principal with this idea this year, because I think that it is important that we all get a sense of what each teacher is "dealing" with. It is hard as school to bring every teacher together and make them realize that we are all working toward the same goal. It is so hard for primary teachers to understand how hard upper grades work to get students to pass the standardized tests and get students to know all of the standards when they are not reading on grade level. And it is so hard for an upper grade teacher to understand that a primary teacher doesn't just play all day. They actually work really hard to get students to read and they have to have the BEST management in order to get all those littles doing the same thing at the same time. 1. 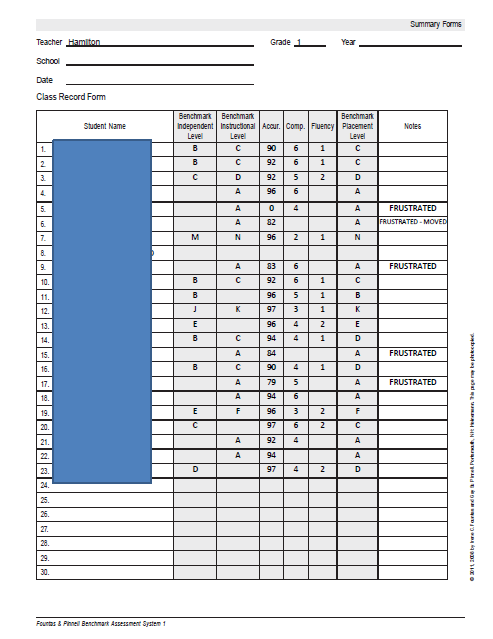 Each teacher completed running records with each of their students to find their instructional reading level according to Fountas and Pinnell. 2. We made our lists of student levels. 3. 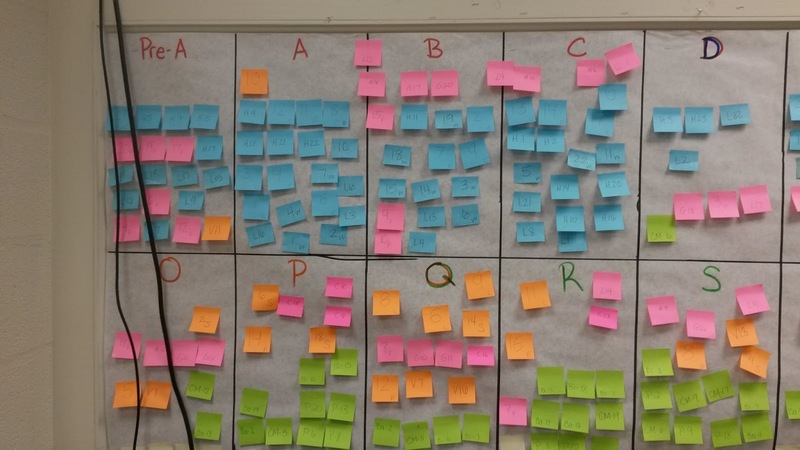 I assigned each grade level a color sticky note. 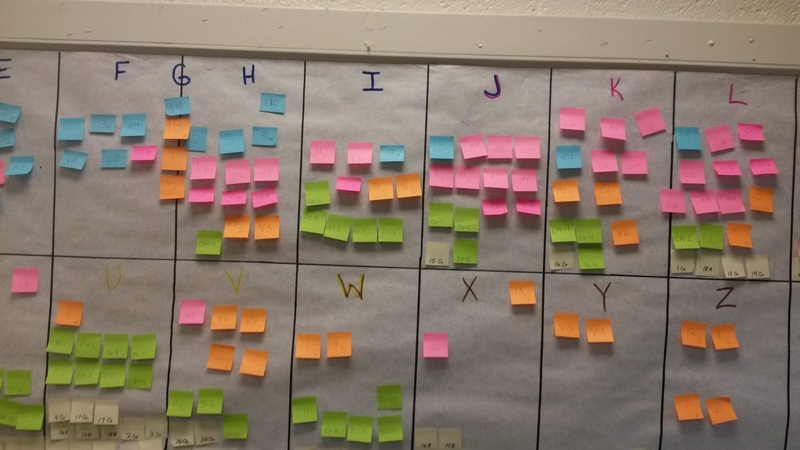 Each classroom teacher created a sticky note for each student in their class by labeling them with the initial of the teacher's last name and the student's class number. 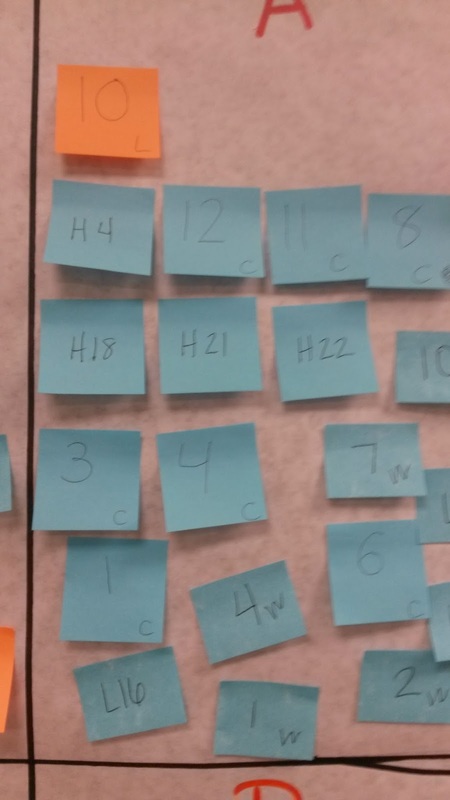 So since my name is Mrs. Hamilton and I teach first grade, I had 23 blue sticky notes labeled H1 - H23. 4. 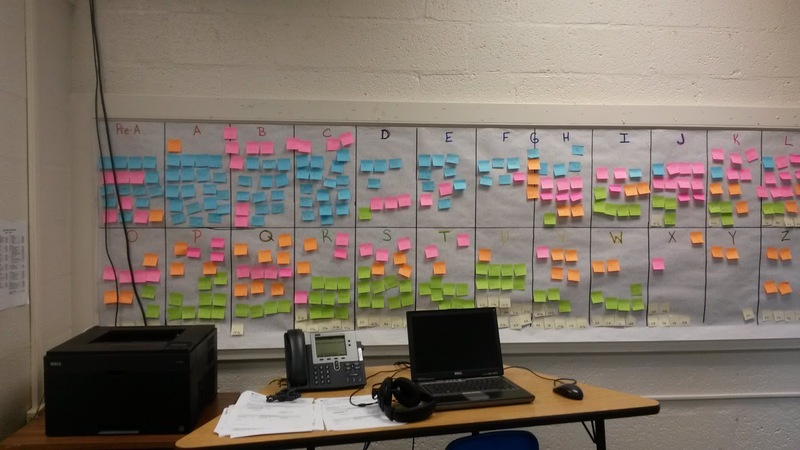 I used a large bulletin board to make a chart with sections labeled Pre-A through Post-Z. That is 28 boxes. 5. 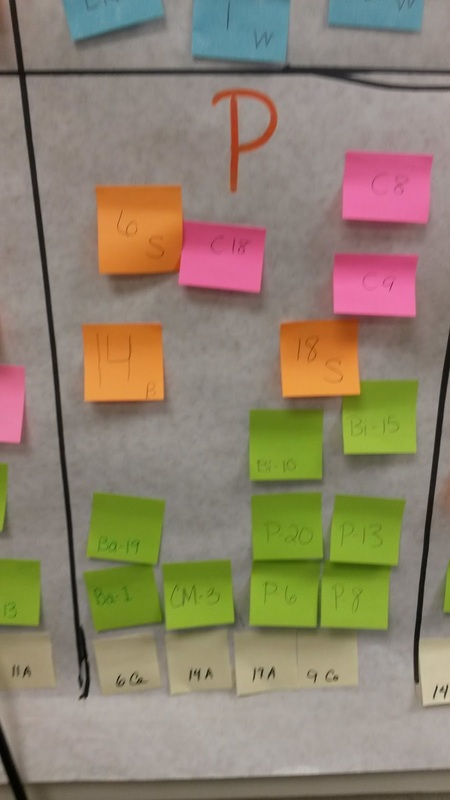 Each teacher posted their sticky note in the section on the chart where that particular child was instructionally. We chose to use the students' instructional levels because we want to look at strategies for teaching our students at each level. Our Kindergarten students are currently not on our wall since so many of them are Pre-A readers. We will be adding them at our mid year testing. Just to give you an idea of our levels, 1st grade is blue, 2nd grade is pink, 3rd grade is orange, 4th grade is green, and 5th grade is yellow. 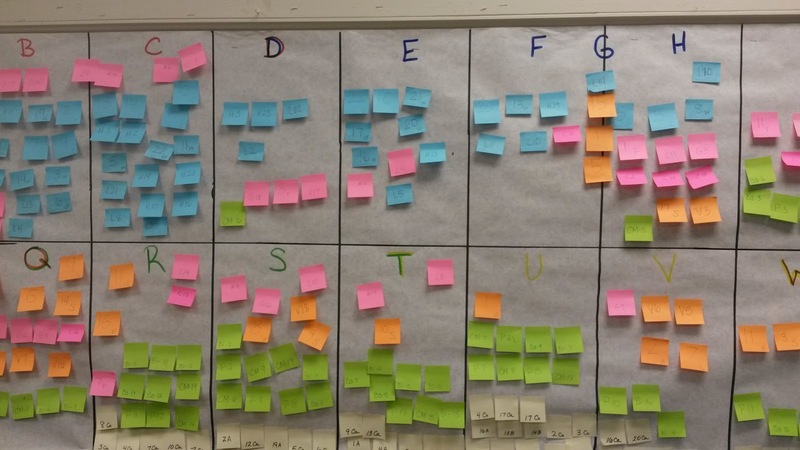 Now, mid year, we will move our sticky notes to our students' new reading levels and look for trends in growth! I can't wait for everyone to see how much we move our sticky notes! Until then, we will spend our once a month reading committee meetings looking for the best strategies for teaching each of these kids at their levels! Wish us luck! I love the idea of having it up for every grade level. It's really interesting to see the progress students are making. You must have a reasonably small school, though. I don't know that we would have a space big enough to do this at my school! We have just over 500 kids in our school so it isn't bad. Perhaps you could make 2 boards, one K-2 and one 3-5? I'm curious whether you all discussed the option of cross grading? It has been discussed before, but it is a very difficult undertaking. Often times you end up tracking students this way (without meaning to) and they never really get out of their "bubble" that they have been assigned. We have done it before within our grade level and I will say that as the teacher with the low class, it was very difficult! I only had 2 students on grade level at the end of the year. While my students made great growth, I had to look deep for it at times and it could be discouraging. My students had a difficult time not having that good model within the classroom. I will say however, that it allowed the other students in other classes to really excel as the teacher was able to focus more on those bubble kids. 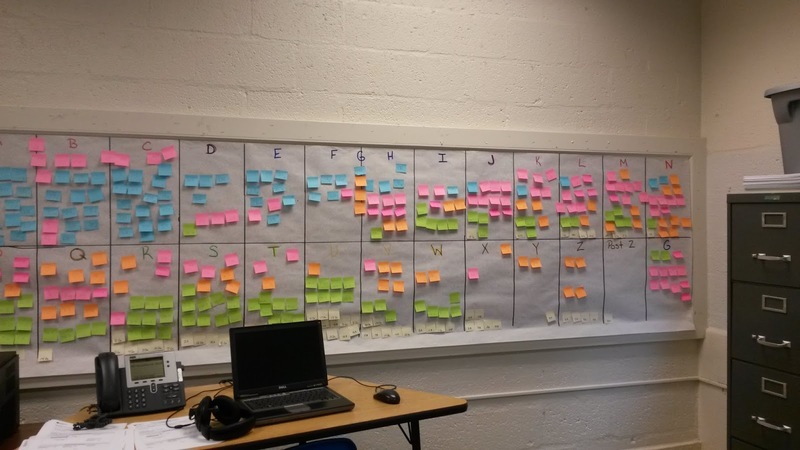 Last year, we also did something similar to this, but only for our reading block. One teacher took all of the low kids during reading for remediation, one teacher took all of the high kids for enrichment, and the other 3 of us took the average level students. Each year, I sit down with my principal and set a goal for the reading committee meeting. My goals are always a little too high and I have to take a few steps back and think small (you know I always want to change the world in a day!). But this year, our goal is to have collaborative resources to use for guided reading and that will align with our data. So our first meeting consisted of putting together this wall and discussing the data trends. We looked for major weak areas that we should focus on. With each following meeting, we will be taking one of the Big 5 areas of reading, dividing into groups, and finding resources and strategies for teaching this area at our assigned reading levels. So our second meeting, for example, we focused on Phonemic Awareness and Phonics. Our upper grades had a difficult time with this one but we have to start somewhere and this is where you start when you teach reading! So Kindergarten researched materials for reading levels Pre-A through C, first researched D-I, second grade researched J-M, and so on. As we find resources and strategies, we are compiling them all together in one folder on our school's network. We are also making a "cheat sheet" of what skills need to be taught at each reading level and in each area of the big 5. So, for example, I currently have a group of students reading at level B. This is what Kindergarten researched and is expected to teach, but I still have to also be held accountable for it. So, I can go into our folder, know that these students should be learning about final consonants (because that is what it says on our cheat sheet) and find a bunch of resources and strategies for teaching final consonants. Next month's focus is Fluency (I decided to cut the upper grades some slack and give them an easier one!). I have seen this done at other schools before. We tried to do it one year but couldn't find a good place for it in our school. 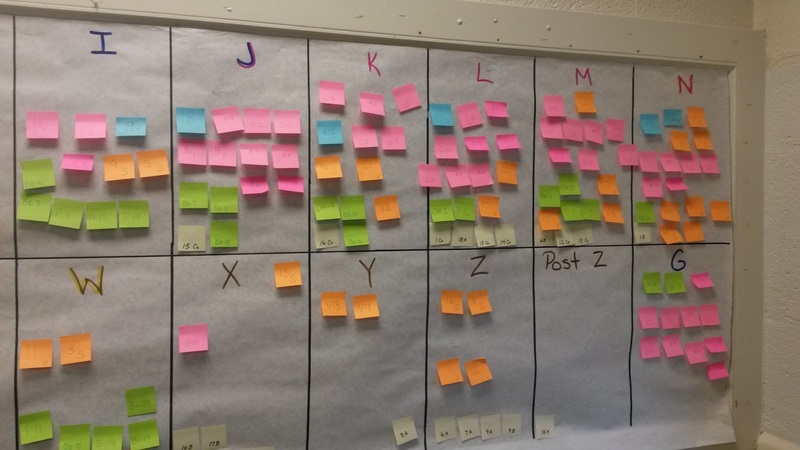 Each teacher had their own "mini bulletin board" made out of a file folder that we used to track our own students' data. It was helpful to see their growth throughout the year. We only did it by below, on, or above to make it simple for each teacher. I really like this idea and would love to do something like this to show every teacher the students' movement. Thanks for sharing and reminding me of this simple, yet effective practice!